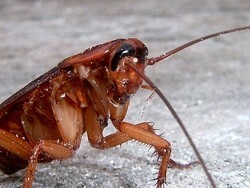 Among the best-known pests are the American cockroach, Periplaneta americana, which is about 30 millimetres (1.2 in) long. Cockroaches live in a wide range of environments around the world. Pest species of cockroaches adapt readily to a variety of environments, but prefer warm conditions found within buildings. The spines on the legs were earlier considered to be sensory, but observations of their locomotion on sand and wire meshes have demonstrated that they help in locomotion on difficult terrain. The structures have been used as inspiration for robotic legs. Cockroaches leave chemical trails in their feces as well as emitting airborne pheromones for swarming and mating. These chemical trails transmit bacteria on surfaces. Other cockroaches will follow these trails to discover sources of food and water, and also discover where other cockroaches are hiding. Thus, cockroaches can exhibit emergent behavior, in which group or swarm behavior emerges from a simple set of individual interactions. Daily rhythms may also be regulated by a complex set of hormonal controls of which only a small subset have been understood. In 2005, the role of one of these proteins, Pigment Dispersing Factor (PDF), was isolated and found to be a key mediator in the circadian rhythms of the cockroach. Research has shown that group-based decision-making is responsible for complex behavior such as resource allocation. In a study where 50 cockroaches were placed in a dish with three shelters with a capacity for 40 insects in each, the insects arranged themselves in two shelters with 25 insects in each, leaving the third shelter empty. When the capacity of the shelters was increased to more than 50 insects per shelter, all of the cockroaches arranged themselves in one shelter. Researchers found a balance between cooperation and competition exists in the group decision-making behavior found in cockroaches. The models used in this research can also explain the group dynamics of other insects and animals. Female cockroaches are sometimes seen carrying egg cases on the end of their abdomen. The egg capsule may take more than five hours to lay and is initially bright white in color. The eggs are hatched from the combined pressure of the hatchlings gulping air. The hatchlings are initially bright white nymphs and continue inflating themselves with air, becoming harder and darker within about four hours. Their transient white stage while hatching and later while molting has led many to claim the existence of albino cockroaches. Call Knott's today for your complete Cockroach Infestation Solution!